Today’s drum lick (#89) comes from an idea I’ve been experimenting with a lot lately. The germ of the idea is the following five note grouping: RLRLF. The orchestration that I prefer is: 1) Right Hand on Snare, 2) Left Hand on High Tom, 3) Right Hand on Floor Tom, 4) Left Hand on Floor Tom, and 5) Foot/Bass Drum. It sounds very cool and smooth once you get it together, and, like any “lick” idea, it can be applied to any rhythmic metric you choose. For example, I’ve used this idea as 16th notes, 16th note triplets and 32nd notes; the decision for which metric to use is made mostly based on the tempo of the music. At slower tempos, 32nd notes might make more sense, or at faster tempos 16th notes might sound better. 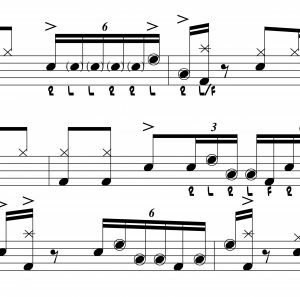 Here, as Nasty Drum Lick #89, we’re going to apply the pattern to 16th note triplets. Check out example #1. This measure of 5/4 shows you what happens when you apply RLRLF to 16th note triplets and continue the pattern until it resolves back to “one.” I like to write this down for all the licks I’m working with so that I can better understand how to make good use of them. For example, it’s easy to see that if I want to play the lick for an entire 4/4 measure, I might just decide to begin with beat one and play through beat 4, because beat 4 ends with the sticking: “RLRL.” That’s a good choice, because I can “get out” of the pattern and back to the groove or something else that I want to play because of that sticking. Below: a video of me playing example #1 a bunch of times fairly slowly. I play the hi-hat on the quarter notes to give you a sense of where the pulse is…that should help. To give you an example of how you can apply #89, I’m going to provide some context using music from my band, LEVEL5. We’ve been playing a song called “Opus One,” written by Oz Noy (in fact, all of our repertoire was written by Oz Noy for us). The song has a drum solo section where there are some hits that I play with the rest of the band, and then, there is some open space so I can solo. Example #2 on the PDF shows a mini chart of some of the rhythms of that section of the song. Example #3 shows you an approximation of what I sometimes play during that part of the song–including Nasty Lick #89. Check out the video of me playing Example #3 below. Feel free to try to play the LEVEL5 idea, or come up with your own. Let me know what you think; I’m always interested in your opinions. PS – Imagine that you could regularly get these Nasty Licks delivered to your email inbox every time we post one. Great drumming vocabulary to raise your drumming level–free. Go do it–just type your email addy into the form below, and click that button. Sign Up Here for More "Nasty Licks"
Great lessons cool licks thanks! You’re welcome! I’m so happy happy that you’re finding the blog helpful.